The figure above shows seasonality in alcohol use. The data has been collected by telephone in the context of a health behavior survey during the period March 1988 up to February 1994. The figure shows the proportion of respondents who answered "yes" to the question if they had consumed at least five alcoholic drinks on at least one occasion during the previous month. 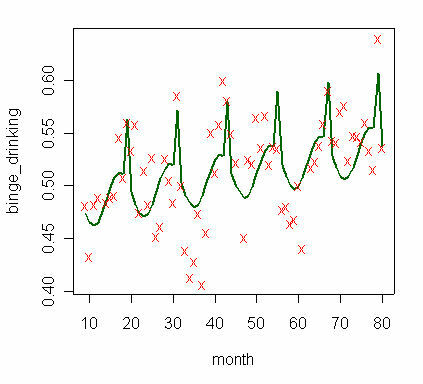 The figure shows an upward long-term trend (estimated with month_since_start_of_data_collection in the regression equation), each month about 0.07% more respondents report to have used 5 or more drinks on at least one occasion during the previous month. The December peak is modeled with the dummy variable, in December 5.2% more respondents report consuming five or more alcoholic drinks on a single occasion compared with the trend. Not considering the December peak, in November most respondents consume five or more drinks on a single occasion, about 2.3% more as can be expected on the basis of the trend. Uitenbroek DG. Seasonal Variation in Alcohol Use. Journal of Studies on Alcohol 1996; 47-52.